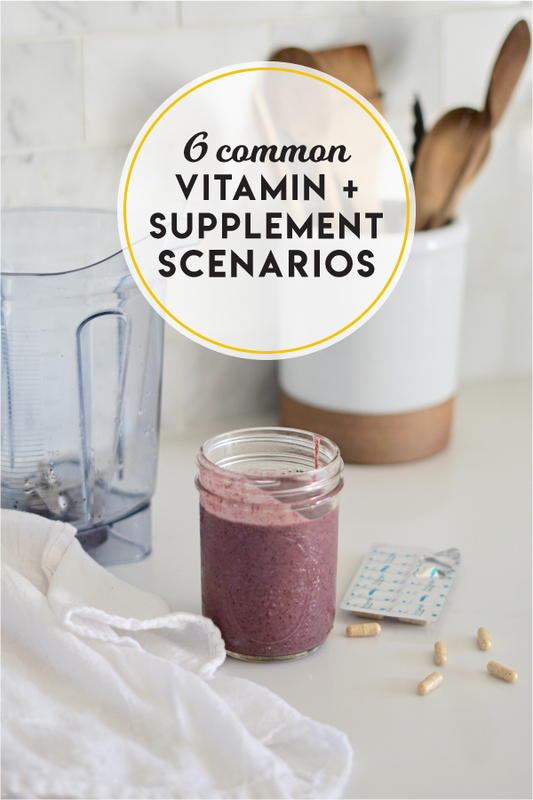 Speaking from past experience (ahem), when you’re thinking about wellness, it can be very tempting to load up on vitamins and supplements based on what you’re hearing from friends or by Internet-armchair-doctoring. The problem is, there’s a lot of misinformation on the Internet about vitamins and supplements, and as much as I love the Internet, the Internet does not fully know what’s best for you! Ultimately, it’s really important to talk to your doctor. Today, as part of an ongoing editorial partnership with Tufts Medical Center, primary care physician Manasa Mouli, MD shares about 6 common scenarios where you might want to talk to your doctor about adding a vitamin or supplement into your health care regimen. 1. I’m a vegetarian and/or vegan. Do I need to take Vitamin B12? A deficiency of Vitamin B12 can lead to anemia (low blood counts), and neurologic problems such as muscle weakness, and difficulty walking. Vitamin B12 is found in many animal products, but not in plant-based foods. So, if you are vegetarian or vegan, you may be at risk for Vitamin B12 deficiency. Some symptoms of vitamin B12 deficiency anemia can be tiredness, lightheadedness, diarrhea, tingling, and numbness. 2. I’m trying to conceive. Do I need to take Folic acid and iron? Having adequate folic acid stores before you get pregnant can prepare your body for a healthy pregnancy. A deficiency of folic acid can increase the risk of neural tube defects in the baby. A neural tube defect is a defect in the development in the vertebrae, spinal cord, or brain, like spina bifida and anencephaly. These defects typically develop before you know you’re pregnant, which is why it is important to supplement with folic acid as soon as you start trying to conceive. Another thing to consider when trying to get pregnant is whether you are getting enough iron. Building up iron stores is important because it is one of the minerals your future baby will get from you while in-utero. You can ask your doctor to check your iron levels. While you may not need an actual iron supplement, you should make sure you are getting enough iron in your diet. Iron rich foods include leafy greens such as spinach, lean meats, salmon, eggs, lentils, and chickpeas. Also check out these 8 things to do if you’re thinking about having a baby. 3. I’m tired and can’t shake it, and sleep doesn’t help much! Do I need to take iron? Iron deficiency can cause fatigue and anemia (low blood counts), due to your body not getting enough oxygen through your red blood cells. Your red blood cells carry oxygen via hemoglobin, a special protein in your cells. Iron is a key part of hemoglobin. If you feel that you are always tired, even when you get enough sleep, ask your doctor about whether you may be iron deficient. 4. I live in New England. Should I take Vitamin D? Sunlight exposure increases your body’s Vitamin D stores. But living in New England means long, cold winters with short periods of daylight. This means that you likely don’t get exposed to enough sunlight to have adequate Vitamin D in your body. Having enough Vitamin D boosts your energy levels, and makes your bones stronger and less likely to fracture. Vitamin D is present in some foods like fatty fish, fish liver oils, and fortified dairy products, but unless you typically eat a diet that includes plenty of fatty fish and fish liver oils, it may be difficult to get enough Vitamin D through diet alone. Experts believe that most people may need 1000 IU (international units) of vitamin D per day for optimal health. A glass of milk has approximately 100 IU, which is only 1/10th of the amount of vitamin D you should be getting! So, a vitamin D supplement might be a good option for many people. 5. I’m approaching menopause. Should I take Calcium + Vitamin D? When you approach menopause, your body undergoes a lot of changes and your estrogen levels drop rapidly. Estrogen usually protects your bones and dropping estrogen levels increase your risk of osteoporosis (a condition where bones thin). This puts your bones at risk of weakening and fracturing more easily. Calcium can help protect your bones against osteoporosis, while Vitamin D helps your body absorb calcium more easily. Here are 12 things to know about menopause. 6. I’m a generally healthy person. Should I still take a multivitamin? If you are a healthy adult who eats a well-balanced and varied diet, and who is not trying to get pregnant and not currently pregnant or lactating, you do not need to take a multivitamin. Multivitamins should be considered if you have a vitamin deficiency, drink alcohol in excessive amounts, or have had gastric bypass surgery, among other conditions. The best way to determine if you should take a multivitamin is by discussing your lifestyle with your doctor. Building a strong relationship with your doctor is key to ensuring you’re living the healthiest life possible. If you’re looking for a new primary care physician, Tufts Medical Center can help! Our primary care practices in Boston, Quincy, Framingham, Wellesley and Woburn have doctors taking new patients. Disclosure: This post reflects a compensated editorial partnership with Tufts Medical Center. All personal commentary on the subject is, of course, my own.